The Congress on Saturday said that party chief Rahul Gandhi could contest the Lok Sabha elections from Wayanad in Kerala, in addition to his home seat of Amethi in Uttar Pradesh. The Kerala unit of the party said Gandhi has agreed to their proposal. In another development, the Congress ruled out any alliance with the Aam Aadmi Party (AAP) in Punjab and Haryana. However, it hinted that it has not yet shut the door on the possibility of an alliance for the seven Lok Sabha seats in Delhi. In Bhopal, Madhya Pradesh Chief Minister (CM) Kamal Nath announced that senior leader and former CM Digvijaya Singh would contest from Bhopal. Meanwhile, the Bharatiya Janata Party (BJP)-led National Democratic Alliance announced its candidates for 39 of the 40 seats in Bihar, at a press conference in Patna. The BJP dropped Shatrughan Sinha, its disgruntled sitting MP from the Patna Sahib seat. Union minister Ravi Shankar Prasad will be the BJP’s candidate on the seat. Sinha, who is set to join the Congress, is the Grand Alliance’s likely candidate for this seat. In Mumbai, the Congress and Nationalist Congress Party (NCP) announced their seat-sharing pact for the 48 seats of Maharashtra. The Congress will contest 26 and the NCP 22 seats. The Congress will give the Palghar seat to the Bahujan Vikas Aghadi from its share and another undeclared seat to Raju Shetti’s Swabhimani Shetkari Sanghatana. From its 22 seats, the NCP will leave Hatkanangle seat for Shetti’s party, who is the sitting MP from there, and give another one to independent legislator Ravi Rana’s Yuva Swabhiman Party. As for the possibility that Gandhi could contest from Wayanad, Congress party spokesperson Randeep Singh Surjewala said party’s state units in Kerala, Karnataka and Tamil Nadu had “urged” Gandhi to contest from these states. “Their sentiments are deeply valued and respected. The party will take a decision,” he said. However, Kerala chief Mullapally Ramachandran said Gandhi has “agreed” to the state unit’s demand. 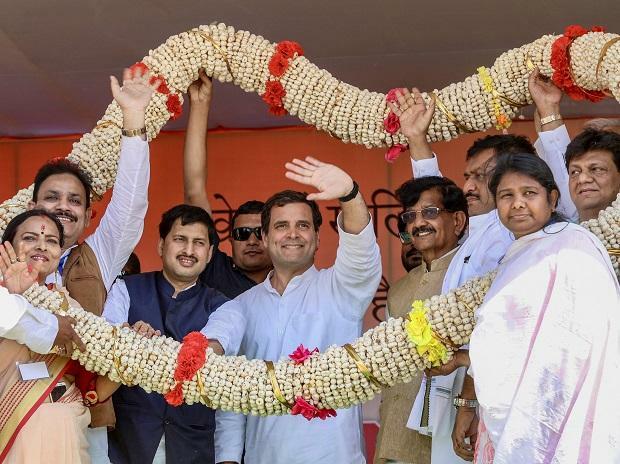 With Gandhi showing a significant lead over Prime Minister Narendra Modi in opinion polls across southern India but lagging in the north, the Congress believes his contesting from the south will help galvanise the cadres. The Congress has already announced Gandhi’s candidature from Amethi. The BJP has fielded union minister Smriti Irani from Amethi once again, where she had lost to Gandhi in 2014. In an attempt at a comeback, she contested from the Medak seat in present day Telangana, leaving her traditional Rae Bareli seat, during the 1980 polls. Sonia Gandhi contested from Bellary in 1999, when the Congress was out of power at the Centre. In 2014, the Samajwadi Party and Bahujan Samaj Party did not field a candidate against Gandhi in Amethi. Relations have soured between the top leadership of the BSP and Congress in recent weeks, with the latter targeting some of the seats the BSP is contesting in Uttar Pradesh. As for the NDA’s candidates in Bihar, Giriraj Singh, the BJP’s sitting MP from Nawada, has been shifted to Begusarai, while Shahnawaz Hussain, who lost in 2014 from Bhagalpur, has been dropped. The two seats have gone to BJP’s allies Lok Janshakti Party (LJP) and Janata Dal (United), respectively. LJP chief Ram Vilas Paswan’s brother Pasupati Kumar Paras will contest from Hajipur after the former’s decision not to contest this year. In Delhi, Congress sources said majority of its workers are in favour of a pre-poll alliance with AAP for the seven seats. The AAP had initially proposed a 3-3-1 formula, with the two parties contesting three seats each and former BJP leader Yashwant Sinha contesting one. The final decision is likely next week.